Did you ever want to control the universe? In this tutorial, I’m going to show you how you can make your desk the center of the universe. You are going to set up a solar system and place the sun, earth and moon in it. Also, we are going to let them circle around each other like they do in reality. I also highly recommend to work through the stretchy line tutorial before starting this tutorial. The reason is, that the solar system builds upon the knowledge of the stretchy line example. You should have opened a new project with a new scene and already imported the ARUnity package. 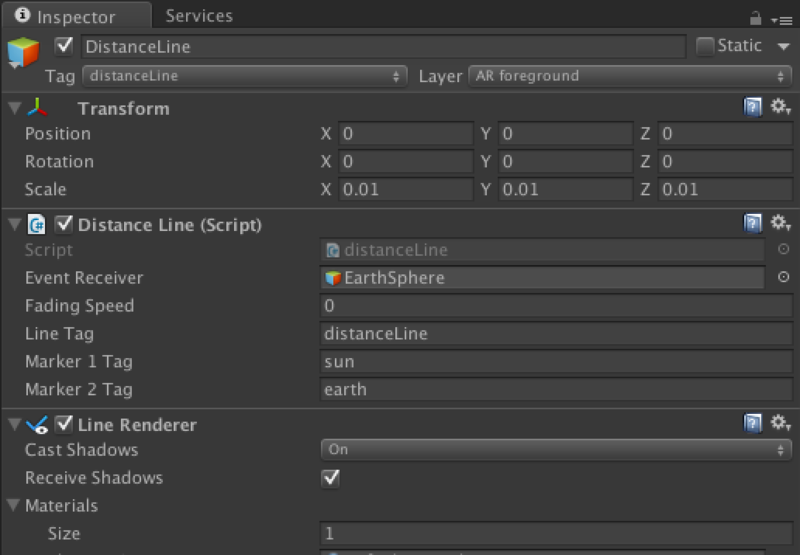 If you need support doing this please see Getting started with ARToolKit for Unity. 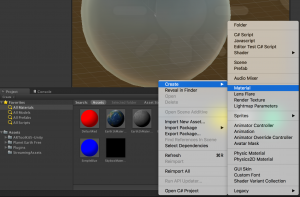 We now set up an AR scene as in the Getting started with ARToolKit for Unity tutorial with the difference that this scene will contain three ARMarkers and three ARTrackedObjects. You can find filter options for each ARMarker script. You may want to play around with those to remove jittering. If you need help during these steps please consult Getting started with ARToolKit for Unity as the steps above are all described there in detail. Now we are going to add and style the actual planets. For the planets add one sphere as a child to the Sun, Earth and Moon GameObject each. 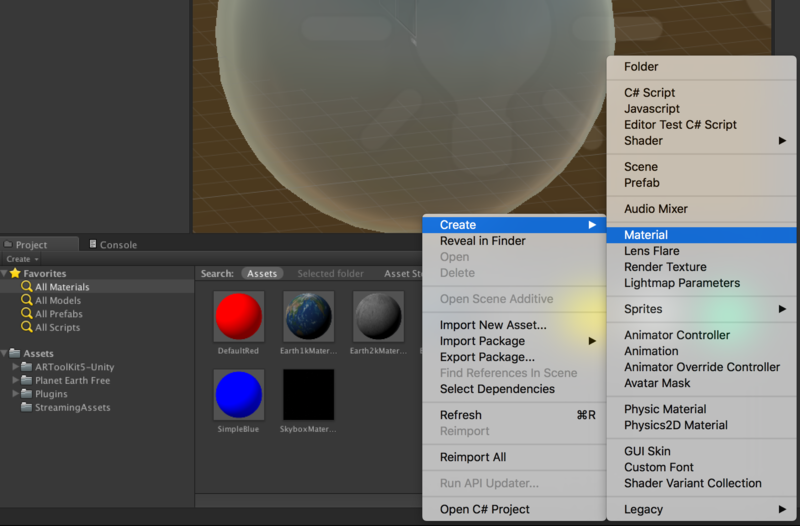 Add a new material to the sun sphere and make it a yellow color. The sun also needs to emit some light so let us do that. Also, we need to set the position of the planets. If we leave them to default they will be placed with their center in the middle of the marker and that is not what we want. Now we are going to measure the distance between the planets (well between the markers that are linked to the planets). This is done in a similar way as in the stretchy line tutorial. Start() is called by Unity once the application starts. OnMarkerFound(), OnMarkerLost() and OnMarkerTracked() is called by ARTrackedObject. 3. In Start() we look-up our line object and store a reference to it. 4. In OnMarkerFound() and OnMarkerLost() we lookup if the found/lost marker is the one we are looking for and store/release references to this marker. 5. 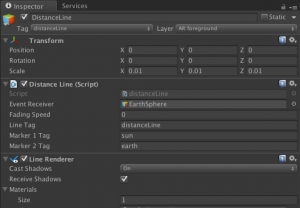 To let the script know which markers we are looking for we define two static string members which Unity will show as text entry fields for this function. We will use this text fields and enter earth, sun, moon tags accordingly later. 6. In OnMarkerTracked() we call a private function to measure the distance and draw a line between the two markers. We use the line as an indicator if the markers have the correct distance between each other. To draw the line, we use etPosition(0,startPosition) and setPosition(1,targetPosition). 0 marks the start and 1 the target coordinate of the line. 8. We also want the line to disappear if only one of the two markers is visible and reappear if all two are visible. We are going to set-up another component that keeps track of the distance changes and kicks off the rotation of the planets. Let’s do this by creating our own component as a C# script. 3. To know which object to circle around define a public member that is used to enter the tag of the GameObject that we want to circle around. While you are at this, define two more members to store the valid min and max distance. We can optimize this a bit if we do not look up the rotateObject every time the line changes but in the OnStart() function. So let’s do that. At this state, the planet is already circling around the other planet. 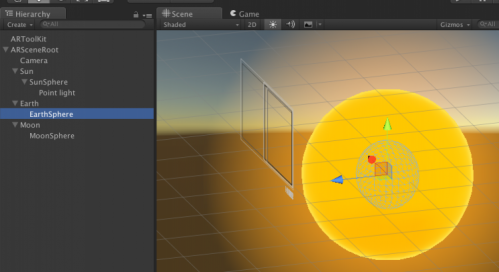 To make it a bit more realistic you can also add the feature to circle in an elliptic way. You can see how that is done in code snippet. To be able to contol the speed the planets circle around I added another public member called rotation speed. That member takes a number value and is multiplied with the time that has passed. Using this you can have the planes circle slow or fast around each other. Tag the DistanceLine with the name distanceLine and add the Distance Line script to it. 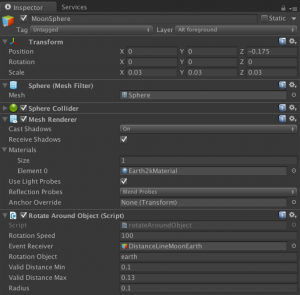 Tag the DistanceLineMoonEarth with the name earthMoonDistance and add the Distance Line script to it. You can play around with this values. 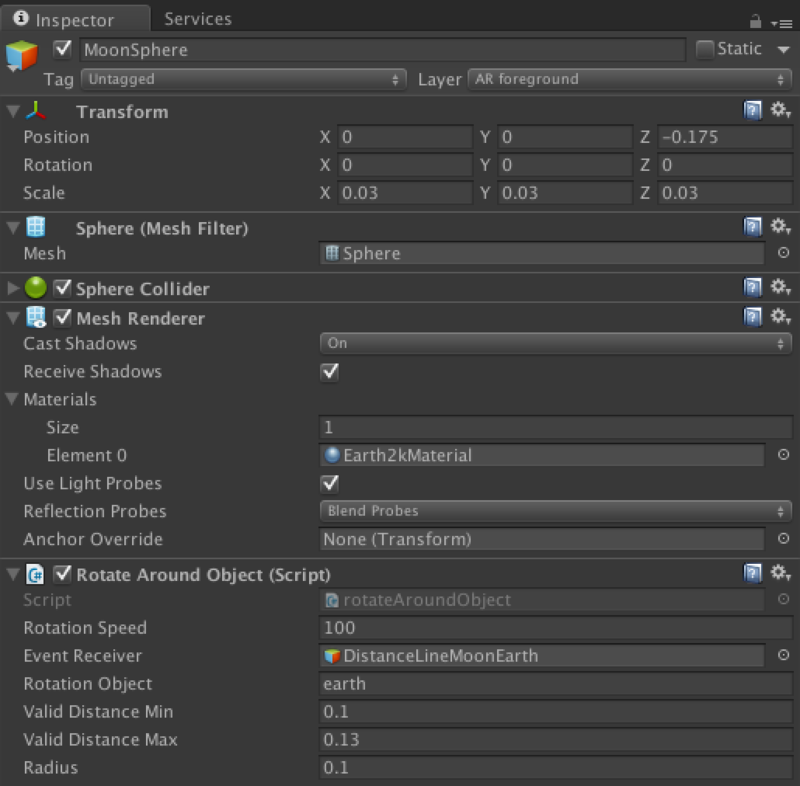 Just the Rotation Object needs to be the name of the object we are rotating around. That’s it now you have everything in place and the solar system is ready to run. Let me know if you encounter any issues, have any question or general feedback. Thanks for reading I hope to see you around soon. Hi 🙂 Great tutorial 🙂 But I have a problem with tracking nft objects. From some reason it track and generate only one nft marker at the time.. it can not track and generate objects of multiple nft markers at the same time. Any idea where can be a problem? Can I get code in C# file?